During a recent “virtual book tour” with several book bloggers, I was asked what three lessons I learned while writing the first two books of my Finding Billy Battles trilogy. It was a good question because it caused me to stop and think about the fiction-writing process in a way I never had before. LESSON #1: When I was teaching journalism as a professor and dean at the University of Illinois, I realized that by teaching I was also learning. The same goes for writing fiction. I spent 28 years of my professional life with the Chicago Tribune, much of it as a foreign correspondent in Asia and Latin America. That work required me to deal with facts, real people, real events and real human emotion. I couldn’t make up what I was reporting. I had to stick to what I saw, what I heard, what people told me, etc. And I had to do my best to write compelling stories using only those facts. I succeeded, but it was often hard work. You need to keep the story “real” even as you make it up. In historical fiction, which is how I classify my book, you need to understand the boundaries of the time and place in which you are writing. Otherwise, you are forcing your readers, many of whom may be more knowledgeable about the time and place in which you have set your story than you are, to suspend their beliefs beyond what they should. LESSON TWO: I learned that if I was going to write a historically accurate story, I needed to do the kind of research that would allow me to create accurate representations of people, places, events, as well as the senses that all authors need to engage readers with when writing–smell, sound, sight, touch, and taste. I spent a lot of time trying to get 19th Century Kansas, Colorado, New Mexico, French Indochina, Hawaii, the Philippines, Yokohama, etc. right. I worked hard on getting the lingua franca of the time and place right. I used a lot of the colloquial speech I grew up hearing my great-grandparents, my grandparents, and my parents use. I incorporated a lot of the idiomatic expressions that were intrinsic to Kansas and the American West of the 19th Century. Your descriptions of Berlin in 1904 must be accurate. 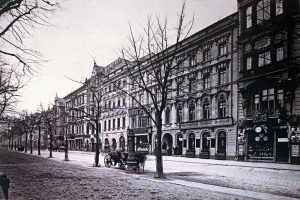 You need to know what the Kurfürstendamm Straße looked like 112 years ago, what trains ran to Charlottenburg-Wilmersdorf, and the way Potsdamer Platz and Alexanderplatz looked. The same goes for Saigon. What did the Rue Catinat look like in 1895 when Billy Battles is there? What about the Continental Palace Hotel where Billy lives (as I did when I was there covering the last stages of the war in 1974-75). What did the streets look like, the people, the modes of transportation? LESSON THREE: I learned that writing the book is the least of the job. Once the book is finished, you have to get it out to potential readers, reviewers, etc. Marketing your book is probably even harder than writing it. I have learned that there is an enormous universe out there of book bloggers, reviewers, book websites like Goodreads, Smashwords, Independent Author Network, Historical Novel Society, Createspace, NetGalley, Story Cartel, Book Daily, Authors Den, iAuthor, Cold Coffee Café, the Alliance of Independent Authors, etc. After I had finished Book 1 in the trilogy, I spent 85 percent of my time engaging with book bloggers, reviewers and the websites above and only about 15 percent of my time writing. So marketing my finished work was a colossal investment in time–and money. My previous books were with traditional publishers, so I didn’t get involved in the marketing process. I probably should have, but that’s another story. Since publishing the second book in the trilogy, I have not spent nearly as much time on the marketing phase. The reason? I set up my various author platforms with the first book. I have a new website; I have a Facebook author’s page, a Google+ author’s page, a Twitter account, a LinkedIn account. I belong to and follow probably two dozen writer groups, many of which specialize in the Historical Fiction genre or are set up to assist independent authors. I like the Indie route simply because you have more control over the way the book looks, the content and the various venues for selling it. However, it does take time, and if you are not ready to make that kind of investment of time, you need to think twice before going the Indie publishing route. As for me, I plan to continue along the Indie path now that I know the lay of the new publishing landscape. The publishing universe is undergoing substantial changes right now. More and more people are writing and publishing books than at any time in human history. That is both good and bad. It is right that those who could never find a traditional publisher for their work can now publish themselves in venues such as Amazon, Createspace, Smashwords, Goodreads, Google Books, Kobo, etc. Then, there are the hundreds of not thousands of small independent publishers (once called “vanity” presses) that will publish your book for a fee—some more reasonable than others. These too are evolving with innovative agreements between themselves and authors that allow a sharing of costs associated with publishing. The weak links, however, remain marketing and promotion. Those are immensely costly, and time-consuming endeavors and there are no guarantees that they will net you enough sales to offset the time and money you invest. That is why creating a multi-faceted author platform is critical. Of course, even that won’t work if you don’t have a good product to begin with. You need a book with a professional-looking cover and a well-formatted interior. But most of all, your book needs to be well-written. A non-fiction book needs information that readers find informative and valuable, and a novel needs to be able to entertain and engage readers on an emotional level.